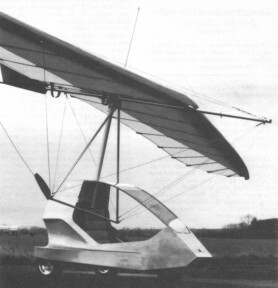 Hornet/Flexiform Sky Sails Invader 440/Dual Striker - A side-by-side two-seat single-engined flex-wing aircraft with weight-shift control. Rogallo wing with keel pocket. Pilot suspended below wing in trike unit, using bar to control pitch and yaw/rod by altering relative positions of trike unit and wing. Wing braced from above by kingpost and cables, from below by cables; bowsprit construction with 65% double-surface; pre-formed ribs. Undercarriage has three wheels in tricycle formation; steel-spring suspension on nosewheel and rubber suspension on main wheels. Push-right go-left nose-wheel steering independent from yaw control. Brakes on main wheels. Aluminium-tube/ glass-fibre trike unit, partially enplosed. Engine mounted below wing driving pusher propeller. All major components made from aircraft-quality materials. The Invader gives weather protection, quick rigging and ease of ground handling a high priority. The wind-tunnel developed trike unit is almost fully enclosed, only the sides being open, and is of monopole construction. The monopole is an aerofoil rather than the usual round section and is mated to a one-piece rear axle instead of the two-piece plus tie wire arrangement commonly used with monopoles. To cope with rough field operation, all three wheels have suspension and in addition the nose wheel geometry is arranged to give a self-stabilising effect, so that the aircraft runs true even if the pilot makes a less than perfect touchdown. A hand operated brake is fitted to the main wheels, arranged so that it can be used as a parking brake. The fuel tank is made from aluminium alloy with internal baffles. Rigging is confined to the wing and is hence claimed to take a maximum of 15 minutes. The trike unit has road tyres on the rear, running on stainless steel axles and taper-roller bearings, so that it can be towed complete on its own wheels. Wing fitment is the Flexiform Skysails Dual Striker, a fast wing which Hornet designer Richard Wolfenden says is well matched to the new trike unit. Length overall 14.0 ft, 4.27 m.
Height overall 12.5 ft, 3.80m. Wing span 38.0 ft, 11.58m. Chord at root 9.0 ft, 2.74m. Chord at tip 3.5ft, 1.07m. Keel pocket depth 1.2ft, 0.37m. Keel pocket area 3.5 sq.ft, 0.33 sq.m. Wheel track 4.3 ft, 1.31 m.
Nosewheel diameter overall 16 inch, 41 cm. Main wheels diameter overall 16 inch, 41 cm. Engine: Robin EC44, 50 hp. Propeller dia-meter and pitch 60x34 inch, 1.52x0.86m. Max static thrust 280 lb, 127kg. Power per unit area 0.20hp/sq.m, 2.2 hp/sq.m. Fuel capacity 5.0 US gal, 4.2 Imp gal, 19.1 litre. Empty weight 290 lb, 132kg. Max take-off weight 682 lb, 309kg. Max wing loading 2.73 lb/sq.m, 13.3 kg/sq.m. Max power loading 13.6 lb/hp, 6.2 kg/hp. Load factors +4.5, -2.0 design.